I went cold turkey on sugar around mid January, and it was a good, good thing. I decided it was my best start in living a healthier life. I managed to hold out til Easter. I had a small hollow Ghirardelli bunny, and I also started my latest addiction. Halo Top ice cream. I first read about this wonder drug when I stumbled onto an article online that appeared in GQ. 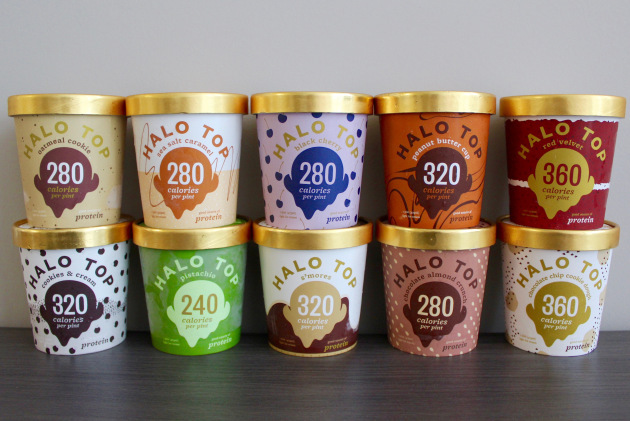 This guy went on an ice cream diet and ate nothing but Halo Top for ten days. He lost a ton of weight and got a little more swole from all the protein. Now, that was about a year ago. But I remembered the brand, so when I saw the stuff in the freezer case at Kroger, I grabbed a pint of Lemon Cake. It remains the best flavor of the lot. Chocolate is second. Oatmeal cookie is third. Everything else is...fine. Not great, but fine. But, unfortunately, I need to stop. Even though it's under 400 calories per pint (and many much, much less), it's not exactly healthy. It uses an odd sugar substitute that is naturalish, but it's still sugar, in a form. And I get plenty of protein -what I need is fiber, veggies, fruit... I don't need a frankendairy dessert, and I sure as hell don't need to eat a pint of ice cream every night, no matter how low-cal it is. So, I have to get off that merry-go-round. Of course, I say that having just polished off a pint of Cookies and Cream (meh) and with two pints (Lemon and Chocolate) sitting in the freezer. But I've been eating it from stress. I now have plenty of healthy snacks in the fridge, and the ice cream can way. In fact, I'm going to stay off the smack until I lose some more weight. Gotta stop the madness. It happens, but it's time to get back to brass tacks. Fiber, minerals... it's all good. ALL. That's the latest from here. I'm going to bed early. It's hard work being the new guy.